Review "Return of the Earth Mother". Carl Sagan's Pale Blue Dot OFFICIAL. carlsagandot.com. Published on Sep 9, 2015. "COSMOS: A SpaceTime Odyssey continues the exploration of the remarkable mysteries of the cosmos and our place within it. Hosted by renowned astrophysicist Dr. Neil deGrasse Tyson, (who was a student of Carl Sagan) this thrilling, 13-part adventure will transport you across the universe of space and time, bringing to life never-before-told stories of the heroic quest for knowledge and a deeper understanding of nature. With an updated Cosmic Calendar, dazzling visual effects, and the wondrous Ship of the Imagination, prepare to take an unforgettable journey to new worlds and across the universe for a vision of the cosmos on the grandest - and smallest - scale." ~ product description from Amazon. "In the late 1960’s and early 70’s, the worlds ecoloby and environmentalism were unknown to the vast majority of the population. Greenpeace: Our Story. 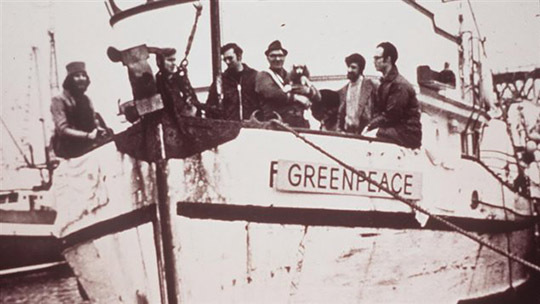 "In 1971, motivated by their vision for a more green and peaceful world, a crew of twelve planned to set sail from Vancouver, British Columbia, in an old fishing boat. These activists believed a few individuals could make a difference. Their mission? To ‘bear witness’ to the US testing nuclear bombs off Amchitka island, Alaska, and prevent the test going ahead.